International Military Technical Forum "Army-2018," dancing presidents, pole climbing contests and biting snakes — the last seven days have given the world a lot to keep up with. Take a look at the most colorful pictures of this week. What could be more solemn and cool than a man and a lethal fighting-machine united by supreme skill and flawless execution of the equipment? 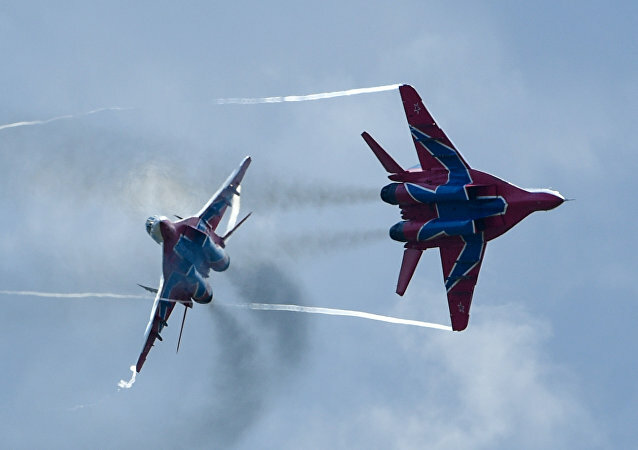 Air shows are the perfect example of this unity, destined to conquer the sky - and the hearts of spectators. KUBINKA (Moscow Region) (Sputnik) - Chinese companies which have arrived in Russia for the annual International Military-Technical Forum Army-2018 are promising to never act against Moscow’s interests, and to instead pursue a lasting partnership in the defense sector while the West continues slapping Russia with more sanctions. Russia’s newest military gear is on display at the Army 2018 International Military and Technical forum in the Patriot Park near Moscow. Russian Helicopters – a part of the tech giant Rostec, brought its latest models to the show and opened the doors of its plant in Kazan to show Sputnik how the helicopters are built. KRASNOYARSK (Sputnik) - Scientists from Russia's Siberian Federal University (SibFU), jointly with Zhukovsky – Gagarin Air Force Academy, will showcase an unmanned helicopter equipped with a radio station capable of working both in the mountains and in the city at the Army-2018 defense industry forum, SibFU press service said. MOSCOW (Sputnik) - The communication between various agencies on ensuring the national security in the Arctic will be discussed at the upcoming Army-2018 defense industry forum in Russia's Vladivostok, the Russian Defense Ministry said Tuesday.